Light a candle for science, reason and truth; for action for the climate emergency; for creation, climate justice and the world's poorest, for the young and future generations and for positive solutions: climate jobs, green energy and a zero-carbon Britain . CEL is co-operating with Campaign against Climate Change (CaCC) to send a strong message to the new government that climate change must be at the top of their priority list in the new Parliament. Service : St Martin-in-the-Fields Church, Trafalgar Square, London, WC2N 4JJ at 11pm, 15th May. Revd Chris Brice (Adviser for Social Justice, London Diocese) will lead the Service and the preacher is Mark Dowd (Operation Noah's Director of Education and Communication; documentary maker and broadcaster). We are very grateful to the clergy at St Martins in the Fields church for supporting this Service and making their church available to us for this Service. Come and join us in London if you can, or hold us in your prayers at home that night. 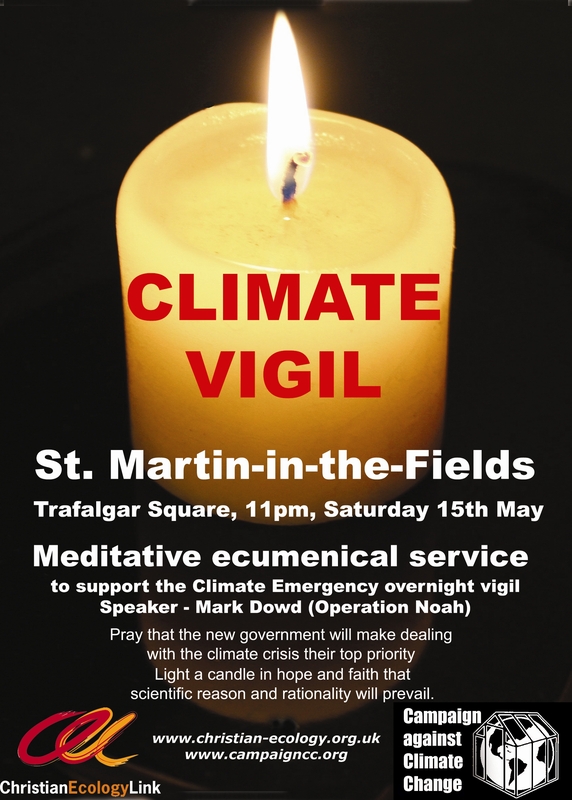 Candlelit Procession for the Climate to Westminster : At midnight we will join the CaCC people gathering outside St Martins in the Fields and walk with them in a candlelit procession down Whitehall to Old Palace Yard, near the Houses of Parliament. After speeches the Vigils begin - CaCC in Old Palace Yard and St Jude's hall and a meditative prayer vigil in Lambeth Mission. Prayer Vigil: CEL are organizing a prayer vigil through the night at the Lambeth Methodist Mission, Lambeth Road, SE1 7DQ. Join us there from 1.30 am to 4.30 am for Prayer, Readings, Classical Music, Taize, tea and toilets. We are very grateful to the clergy at the Lambeth Methodist Mission for supporting this Prayer Vigil and making their church available to us for the night. St Jude's Community Centre, St Georges Road, London SE1 6EZ is hosting an exhibition of work by the artist Marisa Rehana Mann and of subverted airline adverts by the activist group Plane Stupid. St Jude's will be open all night and Brixton Tea Party will provide refreshments. 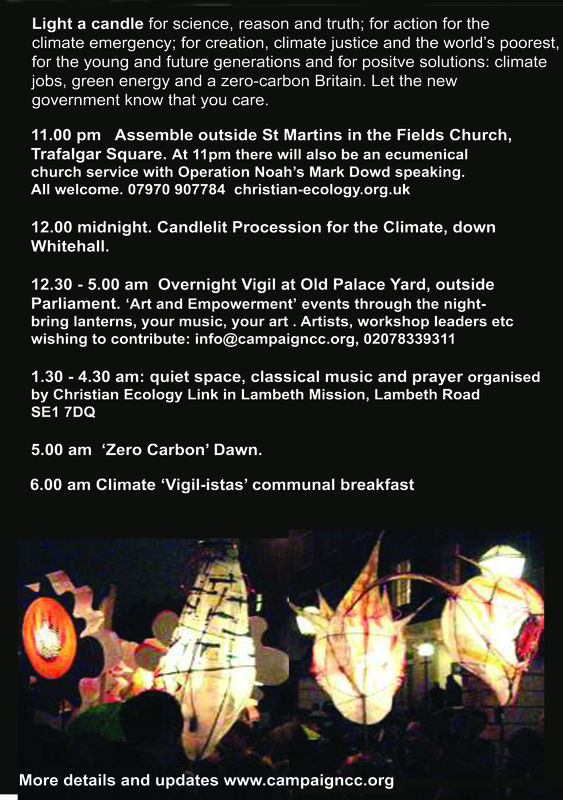 Zero Carbon Dawn Event: CEL supporters will leave the Lambeth Methodist Mission in time to join the CaCC Zero Carbon Dawn event in Old Palace Yard at 5am. Letty Stott of the Guildhall School of Music has created an inspirational 'Call to Action' featuring an Alphorn calling along a chain of brass players to call for a Low Carbon Dawn. Breakfast: The Brixton Tea Party are providing breakfast for a small cost at St Jude's Community Centre after the Zero Carbon Dawn event. Please contact Ruth Jarman if you can help with any of these 07970 907784. Please contact Ruth for more information.